PORT-AU-PRINCE (AlertNet) – For the past month, Yvenna Calixte has been searching for a room and a way out of the Champ de Mars camp, where she lives with thousands of other Haitians left homeless by the 2010 earthquake. Champ de Mars in Haiti’s capital Port-au-Prince was once the city’s main park, but now it is densely packed with shacks made from bed sheets, tarpaulin and scrap metal, which provide flimsy shelter for some 17,000 people. Every day several buses line up outside the camp, which faces Haiti’s ruined presidential palace. The free buses ferry Calixte and camp dwellers like her around the city to look for lodgings under a scheme offering Champ de Mars residents a one-off payment of $500 – the equivalent of a year’s rent – if they can find a new, safe place to live. 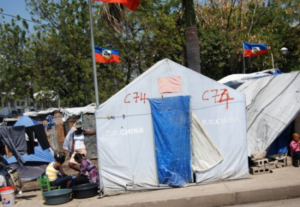 Funded by the Canadian government, the $20 million initiative is part of a plan launched by the Haitian government in January to shut down Port-au-Prince’s most prominent camp within eight months. As the bus lurches away, Calxite hopes this time she will join 176 families who have moved out of Champ de Mars and into rent paid rooms across the city. The first stop is a nearby brick house where a stocky landlord shows the way to a windowless hovel along a dark alleyway. For Calixte, a 32-year-old unemployed mother of three, anything is better than living in the camp. But the room has no toilet nearby and so it is vetoed by a member of the International Organisation of Migration (IOM), one agency overseeing the rehousing project. Luckily the landlord has another room, which is being renovated, in a concrete house across the road. It gets the green light. “I feel better having a home. I’m happy. God willing things will be better here,” Calxite says, signing the rental contract. A mixture of exhaustion and relief brings tears to her eyes as the possibility of life returning back to normal after two years of living among strangers draws nearer. The same urgent desire for proper housing is felt among the dozens of Champ de Mars residents who rise early every morning to make their way to IOM offices nearby. Forming long queues under the searing sun, they are desperate to secure a spot on the buses, get their damaged homes repaired and new homes built on the site of destroyed ones. “These are very poor people and many are illiterate and have been excluded from making consumer choices in the past,” Leonard Doyle, IOM’s communications officer told AlertNet. Doyle said IOM coordinators are going into Champ de Mars every day to explain what type of housing will be approved to receive the rent subsidy and a short film about the scheme is also being shown to camp residents. While the number of Haitians living in camps has decreased by two-thirds from a July 2010 peak of 1.5 million, the pace of people leaving the camps has slowed to a trickle. Efforts to resettle homeless Haitians to new housing or to repaired homes has been hampered by political uncertainty, poor coordination and a cholera epidemic during the first year after the earthquake, along with age-old land tenure problems. From November to January last year, the camp population fell by only six percent – one of the slowest rates since people started to leave the camps from September 2010 – according to the IOM. Around 63,000 camp dwellers have been evicted from private land, while others are back in some of the red and yellow marked 150,000 houses that need to be repaired and or demolished. The new government led by President Michel Martelly says building new homes and restoring neighourhoods is a priority, a task the IOM estimates will take from two to five years. But while progress has been made in clearing half the quake rubble from the capital’s streets, few new permanent homes are being built in Port-au-Prince to resettle the some 500,000 Haitians still living in makeshift camps sprawled across the city. The Red Cross has built a cluster of pastel-coloured houses powered by solar panels and a controversial housing programme on land given by the Haitian government has provided around 7,000 people shelter in wooden temporary houses in Corail-Cesselesse, a desolate area on the capital’s outskirts. But these are the notable exceptions. “Two years after the earthquake there is still no policy in terms of housing. The vast majority of construction has been temporary shelters with a life span between two, maximum five years. There’s no plan, no strategy to make temporary shelters more permanent structures and provide people with access to basic services like water,” Gerardo Ducos, Haiti researcher at Amnesty International told AlertNet in a telephone interview. “I don’t believe offering $500 to a family could be considered an adequate alternative solution to the housing crisis. What happens to the people when their rent money runs out in a year?,” Ducos added. While Haitians wait for the government to build homes, foreign investors are forging ahead. Construction work by several new big name hotel chains is underway. Moving camp residents who face deteriorating conditions to safer housing is becoming ever more urgent. There is the threat of the world’s deadliest cholera epidemic regaining its force with rains expected in June, and drinking water and clean toilets are fast disappearing as more cash strapped non-governmental organisations leave the camps. Meanwhile, camp residents wait as the daily struggle to fend off disease and hunger continues.